The Migration is the term which means the movement of people from one place to other place in searching of employemnet, better conditions of living, better educational facilities, etc to live a better life. 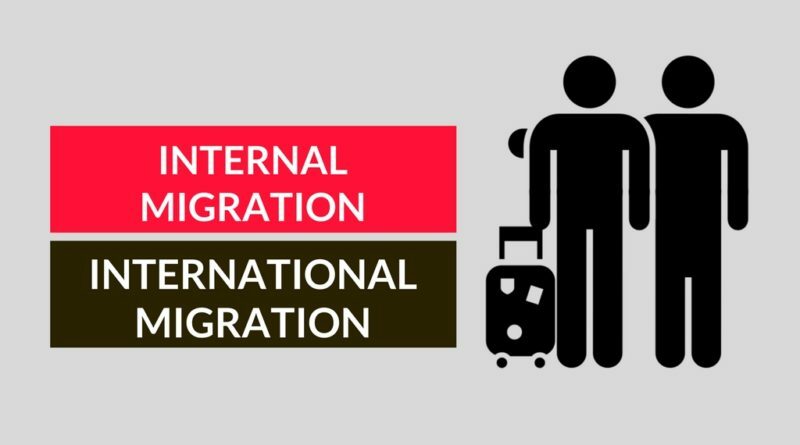 There are various types of migration and this article main revolves around the internal and international migration in a detailed manner. ⦿ Rural to Rural Migration, etc. The people who are migrating to another country should get passport, visa, etc and they must know the laws of the migrating country, etc. The movement of people within a country i.e. between states, districts, villages, etc is called as Internal Migration. The movement of people from one country to other across the international borders is called as International Migration. The Internal migration is mostly seen in the semi-skilled and unskilled workers in the rural and semi-urban areas. The International migration is mostly seen is the professional and skilled people. The government may or may not take care about the internal migrants from other states. The government provides security to the international migrants through Indian embassy's in respective countries. The internal migration do not pose a problem of brain drain. The international migration pose a serious problem of brain drain of highly educated people working for other country's progress. The money sent by the migrants to their families is less when compared to international migrants. The money sent by the international migrants to the home country is very high. The people migrate for different reasons and some of them are as follows. ⦿ Availability of work and livelihood.